Ball and Raytheon technicians integrate the VIIRS Optical and Electrical Modules onto the JPSS-1 spacecraft. Image Credit: Ball Aerospace & Technologies Corp.
March 12, 2015 – The Visible Infrared Imaging Radiometer Suite (VIIRS) has been successfully integrated on NOAA’s Joint Polar Satellite System-1 (JPSS-1) satellite. 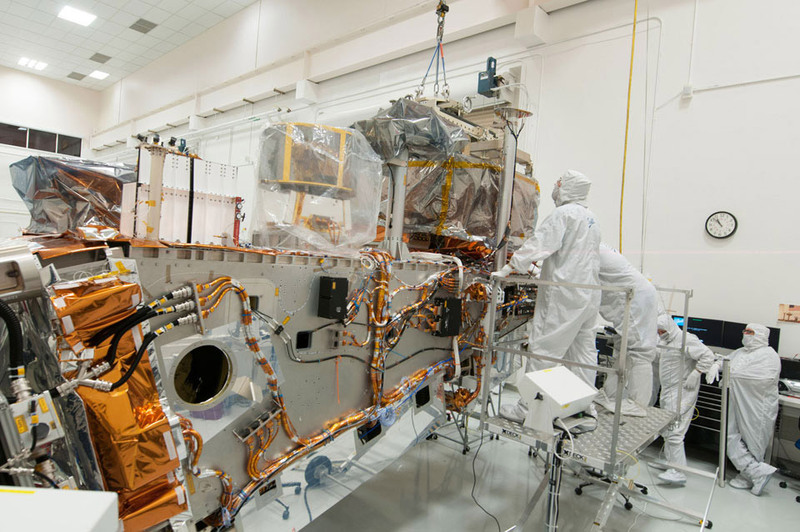 The VIIRS instrument, built by the Raytheon Company in El Segundo, California, is the third instrument to be integrated on the spacecraft by Ball Aerospace & Technologies Corp. in Boulder, Colorado. JPSS-1 is the next polar-orbiting NOAA satellite in the JPSS series and is scheduled to launch in 2017. This is the second VIIRS instrument built for satellites in the JPSS constellation. The first VIIRS instrument is currently flying on-board the NOAA/NASA Suomi NPP satellite. VIIRS collects visible and infrared imagery to provide global observations of land, atmosphere, cryosphere, and oceans and to generate many critical environmental products for monitoring hurricanes, snow, sea ice, clouds, fog, aerosols, fire, volcanic ash, smoke plumes, dust, sea surface temperature, vegetation health, phytoplankton abundance, and chlorophyll. VIIRS features continuous multi-band high resolution imaging capabilities, which can be used alone or with observations from other sensors. VIIRS includes a unique detector for visible imagery at night, called the Day/Night Band, giving forecasters the ability to monitor weather and environmental features around the clock, which is essential for Alaska during the winter months. VIIRS extends high performance imagery, introduced by the Moderate Resolution Imaging Spectroradiometer (MODIS), and greatly improves upon the series of measurements initiated by the Advanced Very High Resolution Radiometer (AVHRR), and the Operational Linescan System (OLS). VIIRS has better spatial resolution, more channels and a larger swath as compared to legacy imagers. This represents twice the coverage of its predecessors and a substantial improvement for ocean ecology and carbon research studies, as well as for establishing accurate estimates of sea surface temperature which are essential for predicting hurricanes and other types of severe weather. These capabilities allow forecasters to better assess and calculate environmental parameters important to weather forecasting such as cloud cover that they may not otherwise accurately detect using other instruments. Cloud cover is important for numerical weather prediction accuracy and many other forecast uses. VIIRS data aids in forecasting sea ice and ocean nutrients, helping maritime and commercial fishing industries by further improving vessel routing and making fishery management more efficient. VIIRS also benefits the agricultural industry through fire monitoring and vegetation index—along with weather warnings—which are critical to yields. JPSS enables forecasters and scientists to monitor and predict weather patterns with greater accuracy and to study long-term climate trends by extending the more than 30-year satellite data record. NOAA is responsible for managing and operating the JPSS program, while NASA is responsible for developing and building the JPSS instruments, spacecraft, and ground system. JPSS-1 is being built and integrated at the Ball Aerospace Fisher Integration Facility, Boulder, Colorado.